Tempura is a Japanese style dish made primarily from seafood or vegetables that are covered in batter and fried. Tempura was initially inspired by Portuguese settlers in the city of Nagasaki during the 1500s. If you want to learn how to make a simple and delicious shrimp tempura at home, we’ve got you covered! You don’t even need a deep fryer to make this tasty dish yourself. The batter to make the shrimp is made of a few ingredients, but it’s the sweet chili sauce that really brings the flavor. The sauce is spicy and sweet, which complement the shrimp perfectly. 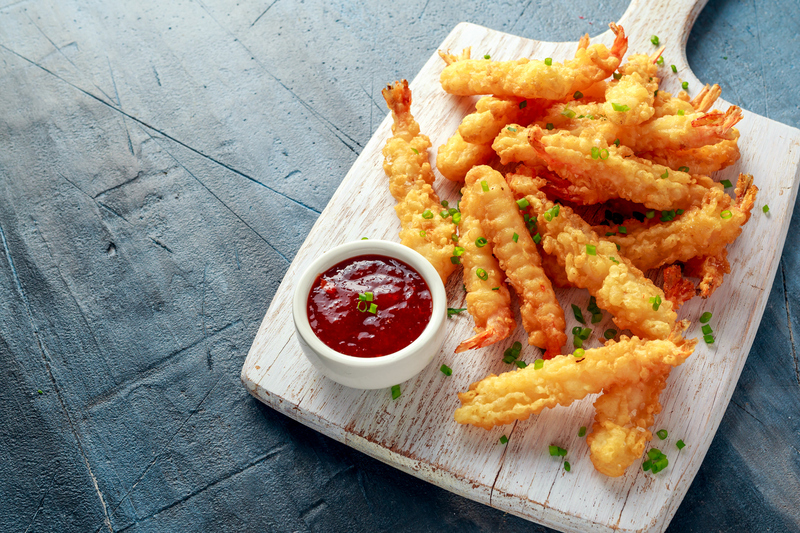 To make shrimp tempura from scratch, follow our recipe below! Prepare the sauce. In a small bowl, whisk together 1/8 cup (2 tablespoons) water and cornstarch. Set it aside. In a saucepan, combine the remaining 1 cup water, garlic, jalapeno, sugar, rice vinegar, and salt. Over medium heat, bring the mixture to a boil. Reduce the heat and simmer it for about three to five minutes. Stir the cornstarch and water mixture one more time. Then, whisk into the saucepan. Cook until the sauce thickens, whisking constantly. Remove the sauce from the heat and allow it to cool. Store in the refrigerator until the shrimp are finished. Heat your oil in a deep fryer or large pot. If using a pot, you may need more oil. The oil should be about 4 inches below the top to prevent splattering. The oil should be heated to 375°F. While the oil is heating, whisk the flour, cornstarch, and salt in a bowl. Push the dry ingredients to the edges and add the water and egg yolk. Mix the ingredients until just combined. Stir in the lightly beaten egg whites. Dip the shrimp into the batter, but do not batter the tails. Place two shrimp at a time into the hot oil and fry until golden brown, about 1 1/2 minutes. When they’re done, take them out of the oil and transfer to the paper towel-lined plate. Let the oil drain completely. Once all of the shrimp are finished, divide among six plates and serve with a side of the sweet chili sauce. Whatever you’re baking or cooking, a dish can go from good to great by using the best ingredients you can find. Fresh, flavorful ingredients make all the difference. At Sauder’s, it’s our mission to provide eggs of the highest quality and freshness for our customers. Use our store locator today to find our top-quality eggs at the nearest retailer to you!